Celebration 2018 came to a close on Saturday. What began 36 years ago as an attempt to save Tlingit, Haida and Tsimshian cultures has become a vibrant reminder that Alaska Native traditions are alive and thriving. In many ways, Celebration is a reunion. Indigenous people from all over Alaska, Canada, even Hawaii, come to Juneau every other year for the cultural festival. Dancing along the parade route in downtown Juneau on Saturday, Owen James of Hoonah paused to hug friends in the crowd. “Folks I haven’t seen in years. Maybe see them only once every two years,” James said. This was James’ 17th Celebration. He only missed one. That’s significant, because there was a time when some feared their cultures wouldn’t survive. Marlene Johnson, who spoke Friday on “A Juneau Afternoon,” said she was reluctant when she first heard the idea to host a cultural gathering for Southeast Alaska Natives. But she knew their cultures needed saving. “It took a long time to get us to the point where we were able to convince the outside world that our culture is not bad, it was a thing of celebration,” Johnson said. Johnson is the chair of Sealaska Heritage Institute’s Board of Trustees. When Celebration first began, decades of cultural oppression and government schools had all but wiped out Native languages in the region. Johnson said you never saw children wearing regalia or singing traditional songs in public just a few decades ago. “When I saw those kids yesterday, the little boys from Yakutat, to see them dancing the way they did, I thought to myself, ‘Everything we’ve done the last 30 years has been worth it,’ when I see that,” Johnson said. Celebration brings thousands of people to Juneau every other year. It’s become one of the largest gatherings in Alaska. Nearly every community in Southeast is represented on the main stage in Centennial Hall, where about 50 dance groups perform new and traditional songs. Film screenings, traditional food contests, art shows, workshops and the ever-popular Toddler Regalia Review keep the crowds busy. 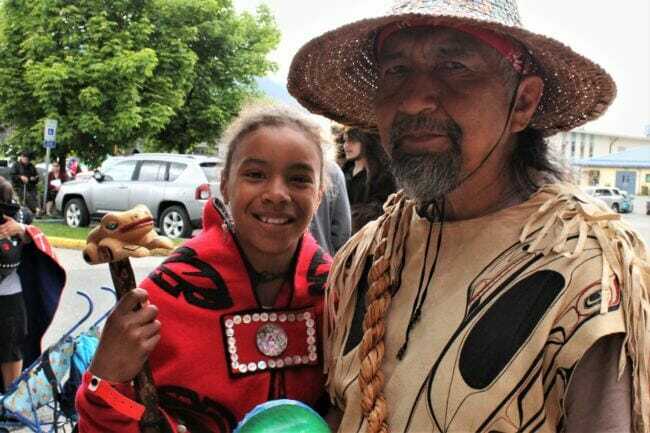 As efforts to revitalize Alaska Native languages continue, elders like James and Johnson can take comfort in seeing the younger generations take on a bigger role in Celebration each time. James’ 11-year-old daughter Leah Moss has never missed one. She can’t wait for Celebration 2020.